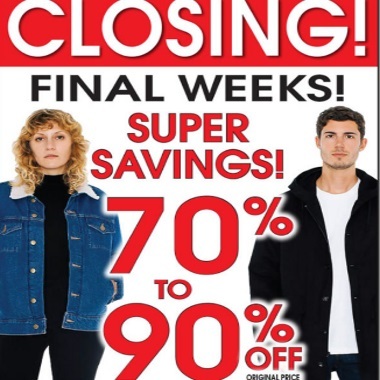 American Apparel is closing all their stores! Following the sale of its intellectual property and some of its manufacturing equipment for $88 million to Canadian brand Gildan Activewear the retailer is closing all their stores, the acquisition did not include stores. Their closing sale is still on and now includes Super Savings of 70-90% off the original prices! The entire store is on sale including basics, hoodies, sweatshirts, jackets, jeans, accessories and more! Everything must go, store fixture and equipment for sale too! I noticed the stores by me in Toronto have hangers on sale for 2/$1, which is pretty good. If you're interested I suggest going soon!